Click to viewMore powerful versions of the MacBook Pro have been released today with up to 2.6GHz Intel Core 2 Duo Penryn processors, and the MacBook Air's trackpad, which allows for multi-touch gestures. The 2.5 and 2.6GHz models come with a new NVIDIA GeForce 8600M GT with 512MB of GDDR3 RAM. The MacBook has also been upgraded (yay! ), but no multitouch (boo! 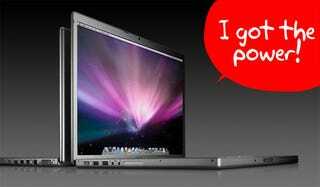 ), probably to make a distinction between them and the MacBook Air. The good, the bad and the ugly, specs and price list after the jump. • New Core 2 Duo versions across the board, which are supposed to be about 50% faster and more power efficient. • New GeForce 8600M GT with 512MB. • Multitouch pad on MacBook Pro. • New LED option on top of the line 17" screen. • No multitouch or LED on MacBooks. • Multitouch trackpad on MacBook Pro is smaller than Air. • Apple Remote is now a $19 option. • Design whores like me will have to wait for the next generation for a new chassis. Clearly, this is a minor bump as we wait for the real things. The new MacBook Pro features the latest Intel Core 2 Duo technology with up to a 2.6 GHz processor with 6MB of shared L2 cache; up to 4GB of 667 MHz DDR2 SDRAM memory and up to a 300GB hard drive, plus NVIDIA GeForce 8600M GT graphics with up to 512MB of video memory. Every MacBook Pro now includes a trackpad with Multi-Touch gesture support for pinch, rotate and swipe, making it more intuitive than ever to zoom and rotate photos in iPhoto(R) or Aperture(TM) 2 or browse web pages in Safari(TM); an illuminated keyboard that makes it ideal for dimly lit environments such as airplanes, studios or conference halls and a built-in ambient light sensor, which automatically adjusts the brightness of the keys as well as the brightness of the display for optimal visibility. Featuring a gorgeous 13-inch glossy widescreen display, and with prices still starting at just $1,099, the new MacBook lineup comes in three models and includes faster processors and larger hard drives across the line; sleek white 2.1 GHz and 2.4 GHz models with 120GB or 160GB 5400 rpm hard drives and a stunning black 2.4 GHz model with a massive 250GB 5400 rpm hard drive, previously only available as an option. The 2.4 GHz MacBook models ship with 2GB of memory standard, expandable up to 4GB across the line. Every MacBook and MacBook Pro includes a built-in iSight video camera for video conferencing on-the-go; Apple's MagSafe Power Adapter that magnetically connects the power cord and safely disconnects when under strain; the latest generation of 802.11n wireless networking for up to five times the performance and twice the range of 802.11g; built-in 10/100/1000 BASE-T Gigabit Ethernet for high-speed networking; Bluetooth; analog and digital audio inputs and outputs; USB 2.0; FireWire(R) and a built-in SuperDrive(R). Every Mac in the Apple lineup comes with iLife(R) '08, the most significant update ever to Apple's award-winning suite of digital lifestyle applications, featuring a major new version of iPhoto and a completely reinvented iMovie(R), both seamlessly integrated with the new .Mac Web Gallery for online photo and video sharing***. Every Mac also includes Leopard(R), the sixth major release of the world's most advanced operating system which introduces Time Machine(TM), an effortless way to automatically back up everything on a Mac; a redesigned Finder(TM) that lets users quickly browse and share files between multiple Macs; Quick Look, a new way to instantly see files without opening an application; Spaces, an intuitive new feature used to create groups of applications and instantly switch between them; a brand new desktop with Stacks, a new way to easily access files from the Dock and major enhancements to Mail and iChat(R). .Mac members can use the new Back to My Mac feature to browse and access files on their home computer from a Mac over the Internet while out on the road.